During the wokou raids of the 16th century Chinese generals faced Japanese pirates, some of them former samurai, who used their large odachi (oversized katana ) to great effect. 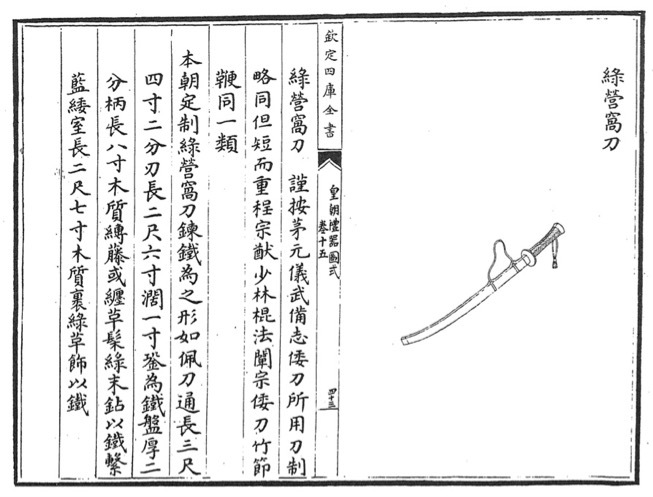 In response, general Qi Jiguang ordered his Ming workshops to reproduce such swords for his army. Their use continued well into the Qing dynasty, the Huangchao Liqi Tushi of 1766 litst as many as five types of long sabers in use at the time by the Green Standard Army, one of them is called a wodao . Due to the ambiguity of the Chinese language this translates both to "Japanese saber" and "Bandit lair saber", and intentionally so! Today the iconic long saber of Chinese martial arts is the miaodao , around which most practice today focuses. My research suggests that miaodao is simply a more recent name for the old wodao . The name change was probably caused by the desire to disconnect this now legitimate Chinese tradition from its Japanese origins. 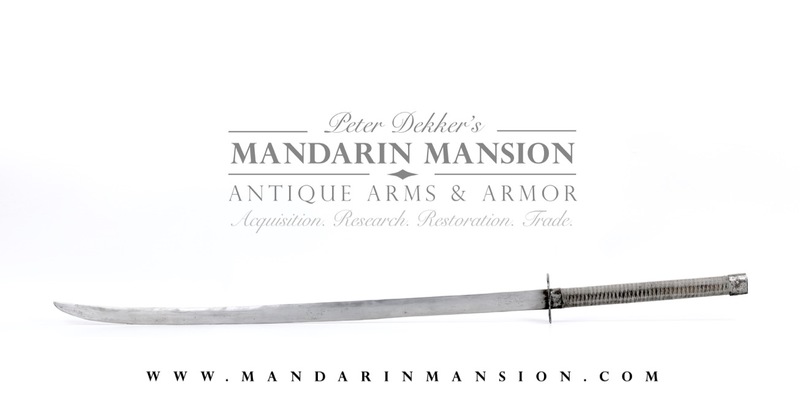 See my article Chinese long sabers of the Qing dynasty for more on this subject. Blade thickness: 8 mm at base, 7 mm middle, 5,5 mm at tip. Presented here is a very rare example of an antique miaodao , probably dating from the late 1800's to early 1900's. It accords almost exactly to the 1766 regulations describing the Qing military wodao , which was 3 chi 4 cun and 2 fen long. This translates to approx. 120 cm / 47 inch, but due to the poor degree of standardization of rulers one can expect small fluctuations in size of the actual product from various workshops, especially those further from the capital. It has a long, thick blade with a central ridge that turns up just before the tip. The blade shows signs of field sharpening, and even though it is not in polish one can make out hints of its forge folded construction here and there. Like all Chinese and Japanese swords, it has a hard, high-carbon edge plate that is protected by many layers of softer iron and steel. Blade retains its original, stiff temper. In its current state, it is not sharp. No nicks or cracks. 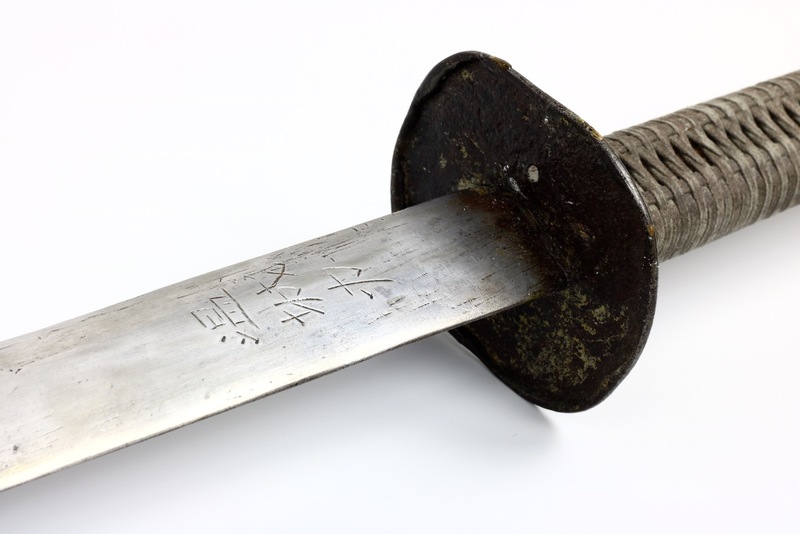 The blade is marked with a curious inscription reading 温城办, which is most likely a name. It is a purely utilitarian piece, no effort has been put into increasing its visual appeal. Fittings are simple, sturdy iron, just like the regulations stipulate. It comes complete with its pigskin scabbard. The scabbard's mouthpiece has seen better days, the end fitting is missing, but the scabbard itself is otherwise in sound condition. Handle is tight, I re-wrapped it with green cord. 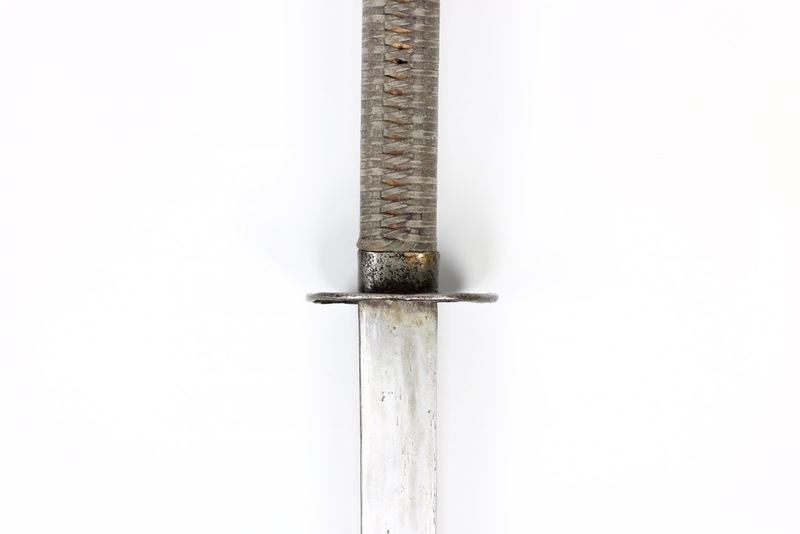 A rare Chinese long saber that accords closely to the regulations of the wodao a.k.a. miaodao . It has a long and massive blade made for business, and otherwise in very utilitarian finish indicating it was meant as a pure fighting piece and nothing else. "Japanese Saber" / "Bandit Lair Saber"
Made of forged iron [as to produce steel], it is shaped like a peidao . The blade is 2 chi 6 cun. It is 1 cun wide. It has an iron disc guard that is 2 fen thick. The handle is 8 cun and made of wood. It is either wrapped with rattan or in braided wrap with [strips of] leather, lacquered green. Iron pommel. It has a blue lanyard. The scabbard is 2 chi 7 cun long, made of wood that is covered with green leather. It has iron fittings. 1. A bamboo-sectioned whip is a very heavy striking weapon. Cheng Zong You is referring to the heavy striking power of the Japanese sword here. 2. This is about the size of the sword described in Cheng Zong You's manual. Variations can be expected due to the lower degree of standardization of measuring equipment during the Qing. Comparison with a standard Qing military saber.